I'm not sure if this isn't my first ever Skywatch post that didn't have some sort of oblique sky reference in the corner somewhere. If one stands on the top of Mt Coolum and looks vaguely west north-westish when the sky is strangely greeny orange, this is what one sees. It reminds me of the sky in a painting depicting the battle of Waterloo that hung in my grandparent's house half a century ago. We lived to fight another day though. It's a stunning shot! I like the flat topped mountain in the distance. "vaguely west north-westish when the sky is strangely greeny orange" -- sounds like me trying to give someone directions. Beautiful photo. 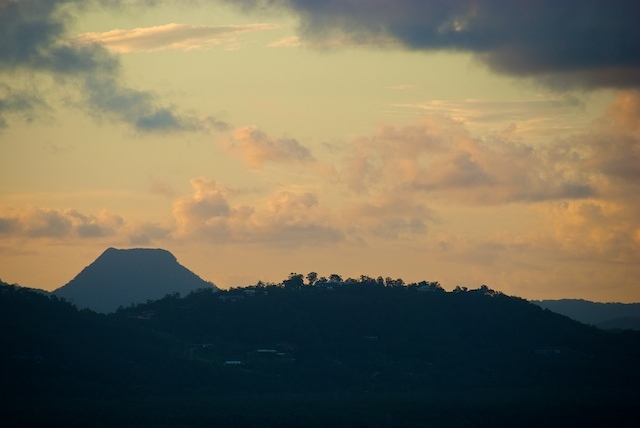 What is the flat topped mountain? Sadly I have not yet confirmed the name of the mountain, it's on the tip of my tongue though and when I remember I'll let you know! Great light! Is it too far north to be one of the Glasshouse Mountains? It is a beautiful shot and the colors are so pretty. Yes Cara, we're too far north, this is not too far west of Noosa. Great shot. You should try Lowes Lookout next time you are up. Absolutely breathtaking views of the sea AND hinterland in one as it looks northward over Coolum.